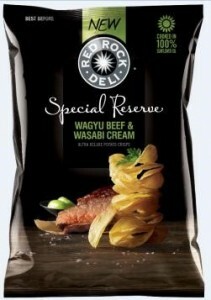 The new ‘Red Rick Deli Special Reserve’ is described as “ultra-deluxe potato crisps” and come in three flavours; Wagyu Beef and Wasabi Cream, Champagne Vinaigrette and Shallot and Creamy Saffron and Sage. Wagyu Beef and Champagne Vinaigrette will be available in 150g and 65g packs, while Creamy Saffron comes only in a 150g pack. The launch of the new range will be supported by TV commercials, outdoor display posters, free samples and social media campaigns targeting “foodies”. Red Rick Deli Special Reserve are available now from Woolworths, independent supermarkets and other selected retailers. The new Smith’s Duos combines two different flavours of chips mixed together in the one packet. Similar products have been successful overseas under the Lay’s brand and have prompted Pepsi Co to bring three flavour varieties to Australia. The flavour combinations are Sweet Chilli and Sour Cream, Chicken and Honey BBQ Sauce, and Garlic Bread and Cheddar. All flavours are available in 150g packs whilst Sweet Chilli and Sour Cream and Garlic Bread and Cheddar are also available in 90g packs. Pepsi Co says it is confident Smith’s Duos will be popular with Australians as their market research has shown that 79 per cent of potato chip shoppers “like to experience all life has to offer and try new things, including food and drinks”. Smith’s Duos are available now at Coles, independent supermarkets and selected retailers.